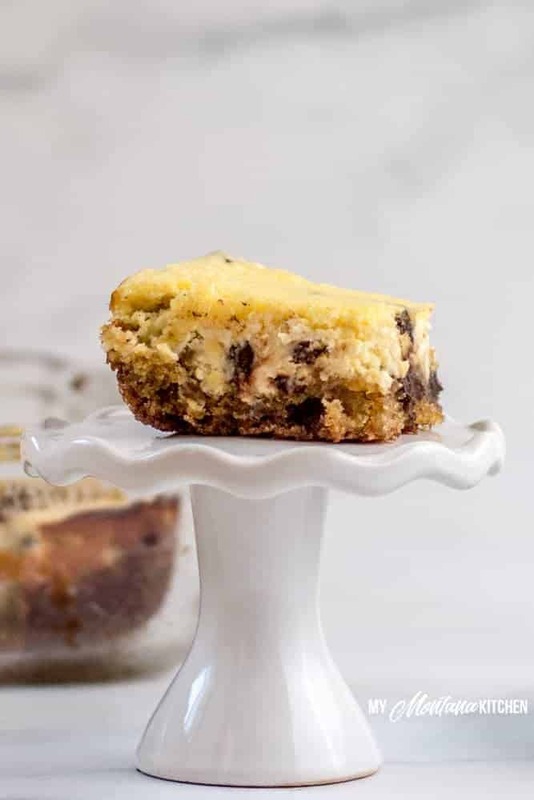 Chocolate chip cookie cheesecake bars are a decadent, delicious, low carb dessert that is easier than a traditional cheesecake to make and fun to share with company (or not share at all…I won’t tell). This low carb dessert recipe is a great way to enjoy sugar free cheesecake with a cookie crust. Perfect for entertaining, a great potluck dessert idea, and just right for birthday parties, this healthy dessert is a winner! 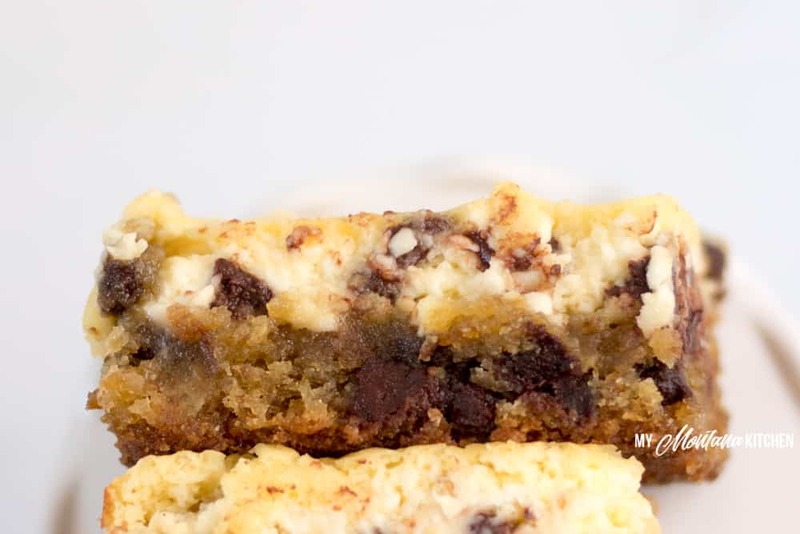 If you enjoyed low carb chocolate chip cookie bars, you’re going to go positively mad for these chocolate chip cookie cheesecake bars. Think the creamy goodness of your favorite homemade cheesecake recipe combined with the gooey, comforting brown sugar and chocolate taste of the best chocolate chip cookies. Drooling yet? And it’s a healthy, sugar free, low carb dessert! Plus, it’s a finger food which totally makes it easier to plate up and share with company (or steal on your way by…shhh). If you’re new to making low carb desserts or you’ve never made a cookie cheesecake bar, no worries. It’s really easy! These chocolate chip cheesecake cookie bars are made in two layers, but baked together. First you make your cookie dough and then you make your cheesecake batter. Be sure to use softened butter, not melted, to cream your butter and low carb brown sugar. This helps give your low carb chocolate chip cookies that authentic cookie texture. You can use a homemade sugar free brown sugar substitute or purchase one. It really boosts the flavor have that smoky, sweet hint of molasses in your recipe and it makes your cookie crust just a tad more chewy (also known as “just right”!). 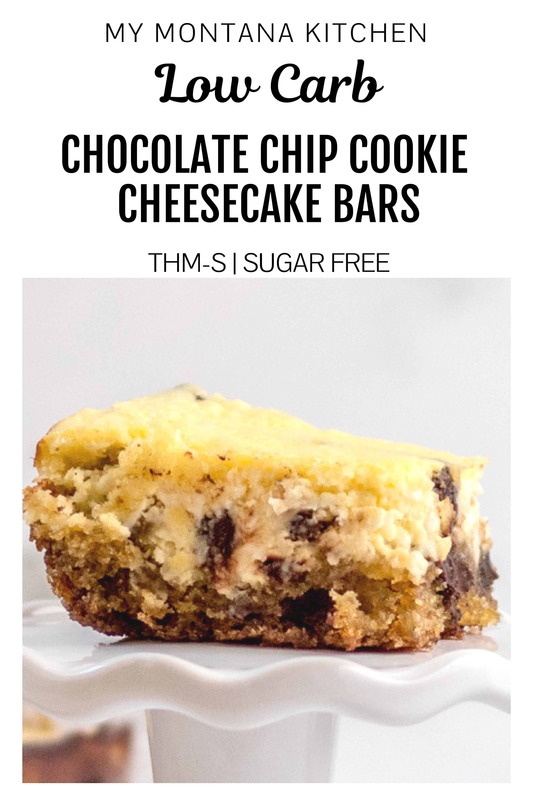 Making the crust, or bottom layer, of your healthy dessert is super easy because you’ll use Trim Healthy Mama baking blend (if you don’t have any, check out the tips section in the low carb chocolate chip cookie bars recipe). Add in the egg and egg yolk (that extra yolk also helps it be chewier and gooier instead of crispy and crumbly!) until you have your dough ready. Press into the bottom of your 8×8 baking dish. The sugar free cheesecake part of this healthy dessert is also easier than you might expect to mix together. Simply whip room temperature cream cheese, THM Gentle Sweet, eggs, and vanilla extract together. 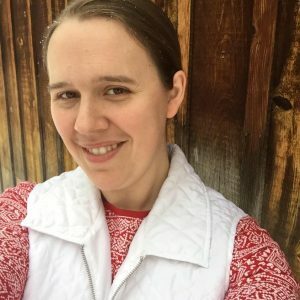 If you need an alcohol free extract, here’s a great homemade AIP Vanilla recipe. After you stir in your chocolate chips, pour your low carb cheesecake layer over your sugar free chocolate chip cookie crust. Bake in a preheated oven and let it cool completely before you cut it to serve. You’ll know it’s done baking when the edges are firmly set, although the middle might still be a tad jiggly. To serve these, you’ll wait until they are completely cool to cut them and put them on a tray. Cover them with plastic wrap and keep them refrigerated (if you’re not eating eating them as soon as they cool). When you’re ready to serve them, simply place the bars on a plate! This recipes makes nine good sized low carb chocolate chip cheesecake cookie bars and is easy to double if you’re making for a crowd. Be sure to store them in the fridge, covered with plastic wrap or in an airtight container. They’ll last several days (up to a week) that way, although they are best when eaten within a few days. Once you see how delicious and easy these are to make, you’re sure to want more sugar free cheesecake treats to enjoy. Be sure to try my Snickers Brownie Cheesecake, Low Carb Chai Cheesecake or any of my other Cheesecake recipes. Trim Healthy Mamas and low carb lovers do not have to do without their favorite desserts with these recipes on hand! 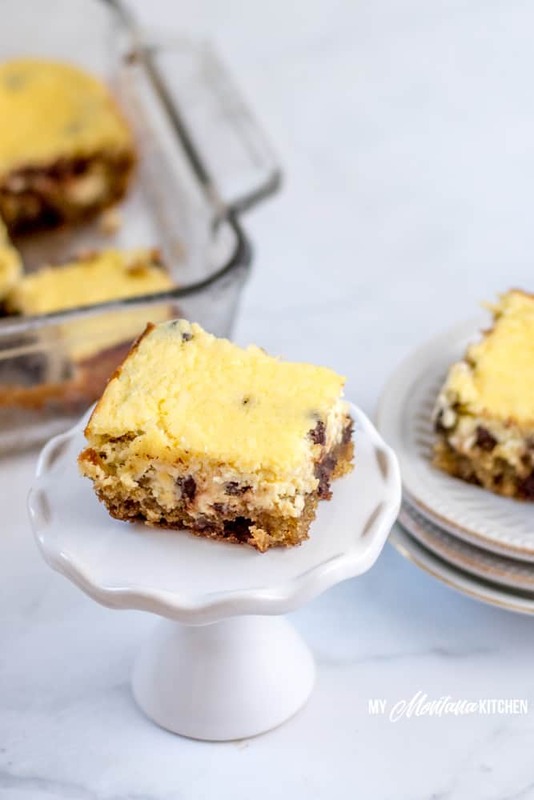 Chocolate chip cookie cheesecake bars are a decadent, delicious, low carb dessert that is easier than a traditional cheesecake to make and fun to share with company (or not share at all...I won't tell). Cream together the softened butter and brown sugar substitute. Add egg and egg yolks and mix well. Add remaining cookie bar layer ingredients and mix well. Press dough into an 8x8 glass dish. Whip softened cream cheese with your mixer and add Gentle Sweet, vanilla, and eggs and mix well. 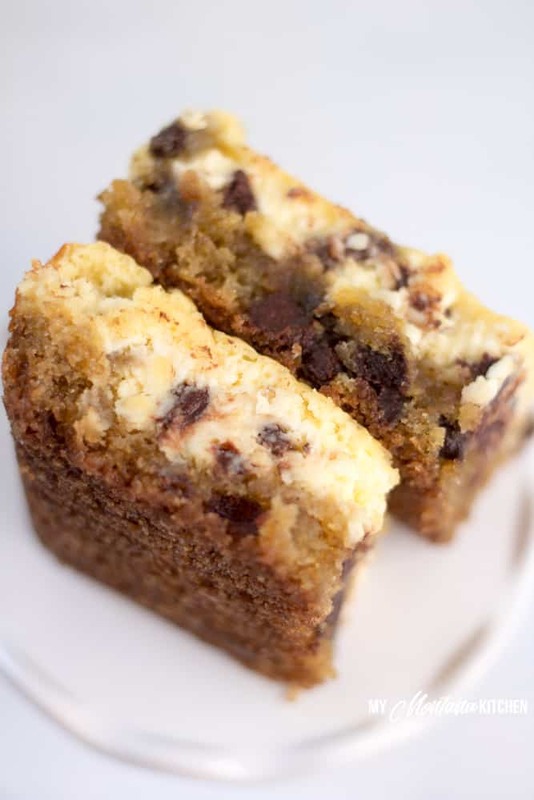 Stir in chocolate chips and pour cheesecake layer onto cookie bar layer. Bake for 35-40 minutes, or until cheesecake has set around the edges (may still be a bit jiggly in the center. Allow to cool completely, cut into 12 bars, and refrigerate. If you do not have Gentle Sweet, you can use my Low Carb Powdered Sugar in the same amount (it measures the same). Would you be able to use THM chocolate chips instead of Lily’s? I love the contrasting textures of the cookie bar and cheesecake layers! And you can’t go wrong when you combine chocolate chip cookies and cheesecake!